Congrats! You've just landed a great summer internship that might even be paid. Your persistent applying and interviewing has paid off, and now's the time to step up to the plate and get ready to shine. Whether you'll be interning in PR, social, advertising or marketing this summer, we have a few no-fail tips that got us through even the most challenging media internships in the past. Get ready work hard, keep your chin up, and know that you're not there to just get coffee. 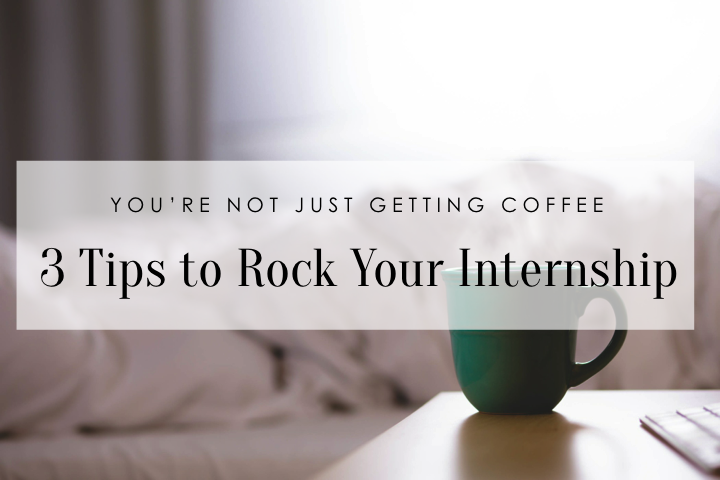 Ready to rock your internship? Keep reading! Take notes everywhere you go. During my first PR internship my boss told me something that I'll never forget and have always stuck to – bring a pen and paper everywhere you go if you want to be taken seriously. Don't be the gal who shows up to an important client meeting sans pen and paper and has to scramble to borrow one, or worse, have your head down taking notes on your phone. Invest in a cute notebook and pen that you'll be happy to carry around – both Poppin and Moleskine have great selections. Volunteer and act before you're asked. One way to stand out during your internship is by acting before you're asked. What do I mean by this? Anticipate the needs of your boss and your office by being proactive. Does the printer look like it's about to run out of paper? Offer to make an Office Depot run to pick up a new ream. Does an RSVP list need to be alphabetized before a big event? Ask to handle that task. When I was interning our firm handled several post-work events for clients throughout the week. Our rule was if you were scheduled to intern the day of an event, you were required to work the event. My off-day was Thursday, but even if there was a client event scheduled that day, I went! It's always nice to go the extra mile and take any time that you can to mingle with clients and media. Don't think like an intern. This is the most important thing to remember while interning – don't think like an intern! Every single day that you walk into work, remind yourself that you're here for a reason, and that your efforts, opinions and the relationships that you establish for your agency or company matter. You'll instantly see the quality of your work improve and you'll be taken more seriously. During my internship we held mid-internship reviews where I was able to fill out a comprehensive survey about my performance and then went over it with my supervisors. In my notes, I added that I felt like I was ready to begin pitching, and wanted to try my hand at writing up more media alerts and press releases. And you know what? I was allowed to! Having that sort of autonomy in my internship simply by speaking up for what I wanted made me so happy, and gave me even more experience. Oh, the sweet memories. I loved being on the job at my great PR internship with Caren West PR in the summer of 2013! Where are you interning this summer? Connect with us in the comments below or tweet us at @HeyWorkingGirl!